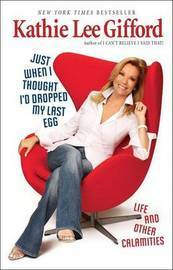 Just When I Thought I'd Dropped My Last Egg is Kathie Lee Gifford's triumphant laugh-out-loud celebration of forging ahead with gusto, even long after we're old enough to know better. Age, after all, isn't a number, it's a state of mind, and being fertile isn't just about having babies, it's about being passionate and creative. Writing with the candor of a friend who knows where the bodies are buried, Kathie Lee reveals the truth every woman of a certain age knows but won't admit- that we love our kids every second of every day but are counting the minutes till they're ready to go off to college, that even though gravity is a constant force, not all parts of our bodies droop at the same rate, and that life and show business share one simple rule- Don't sit by the phone and wait for a man or a job. Full of warmth, humor, and down-to-earth wisdom, this wonderful book is a delectable read for grown-ups of all ages. Kathie Lee Gifford is best known for her fifteen-year role as co-host of the nationally syndicated Live with Regis and Kathie Lee. She recently returned to television as a co-host of the fourth hour of the Today show. In addition, she is writing and producing a number of stage musicals. She lives in Connecticut with her husband and children. i>From the Hardcover edition.